Schmidt named his team at Carton House this afternoon. 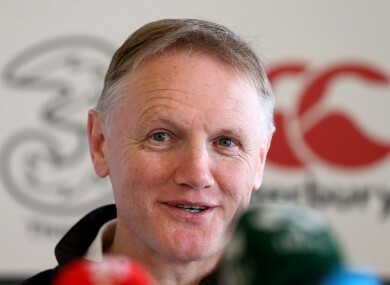 JOE SCHMIDT IS hoping to see a degree of continuity in Ireland’s performance against Georgia on Sunday in Dublin, despite making 13 changes to the team that beat South Africa last weekend. The Kiwi coach has taken the opportunity to blood two news caps in Dave Foley and Dominic Ryan, while men such as Ian Madigan, Tommy O’Donnell, Craig Gilroy and Dave Kilcoyne step into the first team in place of more established figures. From the bench, the likes of Stuart Olding, Kieran Marmion and Rodney Ah You will be expectant of gaining more international exposure. That all these players have pre-existing experience in Schmidt’s group, have worked under his exacting stadards at Carton House, and understand his systems in depth are the basis for the Ireland head coach’s belief that Ireland’s progress can continue. A lot of the players who are playing this Sunday have played for us before or spent a lot of time in camps training,” says Schmidt. “Dave was in during the Six Nations last year, Dominic’s been in before. Schmidt demands nothing less than that constant desire for flawlessness. These relatively fresh faces will be judged by the very same measures as Johnny Sexton, Paul O’Connell and Jamie Heaslip, regardless of the fact Ireland face a team ranked 15th in the world. Sweeping changes to a team often lead to difficulties in finding a cohesive performance, but Schmidt explains that the layout of Ireland’s November fixtures meant alterations were always likely. “I think we’d always planned to make a few changes,” admits Schmidt. “We’ve got a six-day turnaround to Australia and an eight-day turnarnound after playing South Africa just doesn’t seem like enough. Squeezed in between that is going to be another really physical battle. I think to be able to bounce back if you played three in a row is going to be a bit of a challenge. Indeed, Schmidt will be keeping a close eye on Mike Ross and Simon Zebo, the only two players to continue in the starting team after the win over South Africa. Ian Madigan comes in to run Schmidt’s game plan from out-half, starting in his favoured position after jumping around Leinster’s backline this season. Having Eoin Reddan inside and Gordon D’Arcy outside should aid the confident 25-year-old’s tactical performance. “It’s a combination he and Eoin Reddan have played together in a number of times,” outlines Schmidt. “We’ve tried to keep a bit of combination [in the team]. Even if hasn’t been a combination for Ireland before, it’s players who at least know a little bit about each other. It is expected that Ireland’s tactics will be based around running the ball and testing wide channels to a far greater degree than against the Springboks last time out, although Schmidt indicates that it is hoped the strongest elements of that win are repeated. I think as a squad, we have an expectation that there are some things that we can do on the pitch that will promote individuals, because of the team performance. In terms of team performance, we’ve done a lot of work on our set-piece this week. “We’re hoping to get a really solid platform to begin with. From there, we hope to be able to get a bit of continuity into our play to ask a few questions of the defence. We’d like to maintain the defensive intensity that we displayed last week. Email “Schmidt working towards perfection despite wholesale changes for Ireland”. Feedback on “Schmidt working towards perfection despite wholesale changes for Ireland”.